The NFL London 2017 fixtures contain an unprecedented four matchups the most since the NFL International Series started in 2007. In 2017 we have a great line up of teams starting with the Baltimore Ravens taking on the Jacksonville Jaguars on September 24th at Wembley Stadium. Next up we have the New Orleans Saints facing the popular Miami Dolphins on Sunday October 1st, also at Wembley. Then the NFL London 2017 fixtures move to Twickenham where the Arizona Cardinals will clash with the Los Angeles Rams on Sunday 22nd October. We close out the fixtures for NFL London 2017 on Sunday 29th October with the Minnesota Vikings playing the Cleveland Browns. 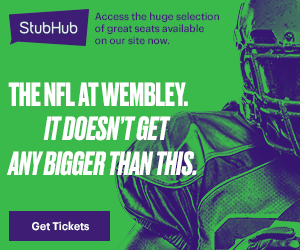 Here at NFL London Tickets we have all the information you need to know to get tickets to the action live at Wembley and Twickenham. I am sure you will agree there are sme great match ups for NFL London 2017. With four NFL London 2017 fixtures the UK fan base has more opportunity than ever before to see the NFL’s greatest teams and stars, live, at two of the UK’s best stadia. Even if you don’t know your Browns from your Vikings or your Cardinals from your Rams get yourself involved and see America’s greatest export, live, up close and personal this Autumn.